The outdoor industry seems to be buzzing about lightweight gear these days. It hasn’t always been like this though, in fact, it’s a relatively recent shift. 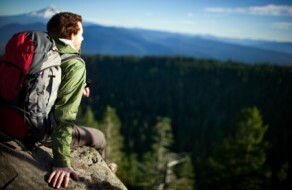 New technologies are allowing companies to make lighter and lighter gear, allowing you, the backpacker, to lighten your load and enjoy your outdoor adventures even more. In this article, we hope to give you the knowledge and skills to cut your pack weight and start taking an entirely new approach to backpacking. Before we discuss how, lets answer why. For many people, the answer is fairly obvious. But throughout my lightweight journey, I’ve come across many backpackers who resist looking into how they can “lighten up.” The most common objection I hear is that they don’t want to be uncomfortable – they don’t want to go “bare bones” and sleep on the ground, cut their toothbrush in half, and eat cold food. OK, OK – I admit that I have cut my toothbrush in half. But my wife hasn’t, and her pack is usually lighter than mine. Cutting your pack weight doesn’t require you to cut your comfort level, in fact, it opens up an entirely new world of comfort. I used to take off my pack to set up camp for the night, and my hip bones would be bruised and raw from my massive pack digging into them all day. Nowadays, my pack is so light that I don’t even use the hip belt. In fact, one of my packs doesn’t have a hip belt. Yet I still sleep in a tent, with a sleeping pad, after enjoying a nice warm meal. Keep reading and we’ll show you how you can do the same. The next thing I want you to do is create a spreadsheet detailing your pack contents and their respective weights. A scale and a spreadsheet will hold you accountable for what you put in your pack. It will allow you to see what you need to do to achieve your goal, and it will surprise you to see how all of those “last minute” items can really add up. Be sure to always weigh the gear yourself – don’t trust the manufacturer’s specs! Unfortunately, some companies can be quite off on their weights. So where should you begin? Five years ago I asked myself the same thing. I was determined to lighten up for my next trip, so I started trying to cut weight. I bought a nice light titanium pot and ditched the mess kit. 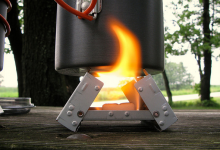 I traded my butane stove for an Esbit stove. I bought a lighter sleeping pad. After all my hard work and new gear, I hit the trail only to discover that my pack didn’t really feel that much lighter. I was focusing on the wrong areas. I have since learned that the key to getting started is to focus first on the following three items: your backpack, your shelter, and your sleeping setup. These three components make up the bulk of your pack weight, and cutting weight here will produce the most dramatic results. You’ll notice lightweight backpackers use the term “base weight.” Base weight refers to your backpack and all of the gear inside of it, minus any food and water you may be carrying. “Total pack weight” would be your “base weight” plus food and water. The reason for this is to allow you to compare “apples to apples.” My total pack weight for Trip A might be 25 lbs, and my total pack weight for Trip B might be 15 lbs. The thing is, Trip A is a week-long trek, and Trip B is an overnighter. The amount of gear I’m bringing on both trips is most likely the same, the only difference is the amount of food I have to bring. Having a measurement of “base weight” allows me to realize that I went just as lightweight on Trip A as I did on Trip B.
You’ve got your scale and you’ve got your spreadsheet filled out with your current backpacking setup. Now what? If using Excel, duplicate your current worksheet, and start building your ideal pack. Plug in the weight of a lighter pack, sleeping bag, and tent, and see what happens to your base weight. Play around with the numbers and see what else you can do to drop that bottom line. Your Gear Now Works As A Team! Don’t rush out and buy that awesome new pack you just saw online, or that nice light sleeping bag your friend just told you about! You can’t just buy individual pieces of gear anymore – you need to start thinking of all of your gear as a whole, and how each piece of gear works with the rest of your setup. I discovered this the hard way, and bought a lot of new gear that I didn’t need. I hope to help you avoid this! Let me throw out a scenario – something that I experienced first hand. You’re all pumped up after reading this article, and since I told you which three things you should focus on first, you decide to upgrade your backpack. You find the lightest pack that REI sells in the 5,500 cubic range, buy it with your 20% off membership coupon, and your life now has new meaning. While you’re there you also buy a nice new pair of heavy-duty leather hiking boots that go up and over your ankles for extra support. Several months later, you decide to focus on your sleeping bag situation. You buy an awesome 800 fill down quilt, and again, your life has new meaning. (Come on – I’m not the only who gets like this after a new gear purchase, right?) Several more months go by, and you’ve since upgraded your tent as well. You also bought a lightweight down jacket and ditched your bulky, heavy coat. Spring has arrived and you start packing your backpack for your upcoming trip, only to find out that while 5,500 cubic inches used to be required for all your gear, you now have way too much empty space in that pack! In addition, last year you thought you needed a solid, sturdy internal-frame backpack with a thick hip-belt for padding. After all of the gear upgrades you’ve done, you no longer need a heavy internal-frame pack, and the hip-belt is way too big for what you need. After lacing up your heavy leather boots, you realize that they’re a bit overboard, considering your new setup is just a tad-bit heavier than the backpack you wear around campus everyday. You’d feel way more comfortable with some shoes designed for day-hikes or trail running. These are some of the pitfalls I encountered when I began my lightweight journey. Even if you can’t upgrade all of your gear at once, make a plan of what you’re entire setup will eventually look like, and buy your gear accordingly. Don’t rush your purchases – stew over things for a while, and make sure it fits well with the ideal pack you have planned. If lightweight backpacking is nothing new to you, I hope I’ve given you a few things to think about. If this is your first encounter with the concept, or have heard about it before but haven’t known where to start, I hope this article can guide you toward success. Read through our other gear articles to gain some insight into what specific pieces of gear might be right for you. I know you’re here because you love backpacking, and I promise that as you start cutting weight, the great outdoors will be even more enjoyable than ever before!